Not much imagination is required to appreciate the impact in Indonesia of Barack Obama‘s recent visit. There he was, using phrases of the Indonesian language not like some stumbling tourist but rather as one who has real roots in the nation. His reminiscences of his boyhood exploits stirred the spirits of this rising Pacific power that can claim the President of the United States as one of its own. Aside from the President‘s personal ties to Indonesia, as home to the world‘s largest Muslim population this was a logical place for Obama to continue his outreach to the Muslim world. His November 10 Jakarta speech was much anticipated as a sequel to his June 2009 address in Cairo, which was a beautifully written, heartfelt appeal to build lasting bridges between the United States and Muslims around the globe. But after a brief surge in popularity for Obama and the United States among Muslims, America‘s reputation has been in steady decline, particularly among Arabs. The reason: beautiful words are like gorgeous hothouse flowers; when exposed to the world‘s harsh environment, they quickly wilt. In the instance of the Cairo speech, the wilting was caused principally by America‘s perceived inability to advance the interests of Palestinians in their endless disputes with Israel. 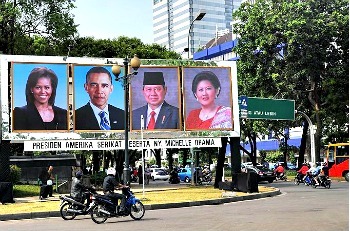 Portraits of President Obama, first lady Michelle Obama, Indonesian President Susilo Bambang Yudhoyono and his wife, Ani, in Jakarta. The deflating of the Cairo-born optimism is a shame because aside from Palestinian-Israeli matters, the Obama administration has accomplished much in its efforts to build better relations with the Muslim world. “Science diplomats,” Nobel Prize-winners amongst them, have been dispatched by the U.S. government to Arab countries to accelerate progress in places where corruption and anger have let progress pass by. Another significant U.S. initiative has been to identify young Muslim entrepreneurs and make available to them some of America‘s great assets in mentorship and collaboration. To its credit, the Obama administration has, for the most part, been able to this without seeming unduly patronizing. President Obama Speaks to the Muslim World from Cairo, Egypt. June 04, 2009. The crowd reacts as President Barack Obama delivers a speech in the Field House at the University of Indonesia in Jakarta, Indonesia, Nov. 10, 2010. © Pete Souza, Official White House Photo. President Obama delivered a speech at the University of Indonesia in Jakarta on November 10, 2010. As presidential speechmaking, that‘s not bad. But the references to Islam in Jakarta seem merely tangential when compared to those in Obama‘s Cairo speech. Several plausible reasons for this exist. The sting of the U.S. congressional elections earlier that week was still burning, and with nutcases in America advancing the notion that Obama is a Muslim, the White House may have wanted to avoid more overt references to rapprochement with Islam. Also toned down from the Cairo speech were references to combating violent extremism. This case illustrates how fears about potential domestic political blowback might inhibit the Obama White House in its outreach efforts. Good intentions abound within the administration, but a restive public and a combative new Congress may limit diplomatic ambition. Also, the post-Cairo disappointment among Arab Muslims may have made the Obama administration newly wary about the costs of creating unrealistic hopes. 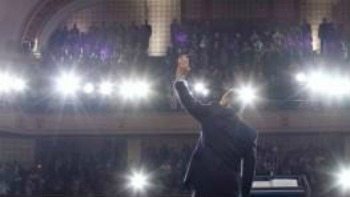 As the articles cited in this edition of PDiN Monitor illustrate, international news coverage reflected lower expectations about the Jakarta speech – perhaps a facet of the diminished clout of “Obamamania” worldwide. But the coverage did recognize that outreach to the Islamic world remains an Obama priority. Although no single speech – or even series of speeches – will “fix” the relationship between the United States and the Muslim world, President Obama deserves credit for recognizing this as an incremental process. He will need to reiterate, frequently and in many places (including at home in the United States), the message he delivered in Cairo and Jakarta. President Obama‘s long-awaited visit to Indonesia was covered extensively by many international news outlets in the days sur-rounding his trip. Below is a selection of stories concerning the November visit as aggregated by CPD‘s PDiN Research Team.